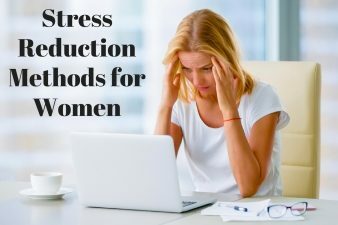 This article is designed to help eliminate stiff necks and teach you how to relax your shoulders. Slumping and unconsciously hunching over your desk forces muscles along the spine and shoulder blades to overstretch and even weaken. Eventually, these muscles harden. This process then forms tough and resilient cords to protect the muscles from further damage and strain. This constriction is why tenderness, inflammation, spasms, and pain ultimately arise in the neck and shoulder area. The digital age arrived with many gifts and advantages such as beautiful innovations, connections, and applications. However, the electronic era also planted some dangerous distractions. Peering down at screens to compare social media accounts, text friends, and even work online can take a severe toll on the body, specifically the neck and shoulders. In order to eradicate these symptoms, the root of the problem must first be identified and solved. For example, slumping is not necessarily the sole cause of neck and shoulder pain, but simply a result of a deeper issue. Slumping is caused by tightness in the upper chest which causes the shoulders to be simultaneously pulled forward and downward. Once the tension in these muscles is thoroughly released, true healing can begin. 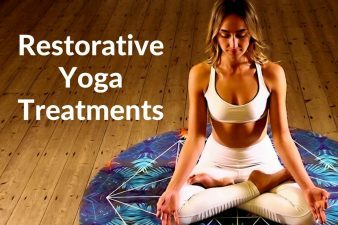 There are a few yoga poses and techniques that target the problem directly and effectively. One of the most restorative yoga poses for upper and lower back pain. Child’s Pose also stretches the hips, thighs, and ankles while releasing stress and muscle fatigue. It gently relaxes the ventral muscles while stretching the muscles of the torso. Child’s Pose is beneficial to those who suffer from back and neck pain. This is because, if the head and torso are supported, it relieves upper spinal and cervical pain. This is very good to eliminate stiff necks. • Start by sitting on your knees. • Gently lower yourself, arms stretching out in front of you until you are lying face down. • Breathe in deeply and exhale slowly. • Feel the muscles of your back and neck contracting and relaxing, while still controlling your breaths. • Gradually reach further but DO NOT continue to reach if intense pain occurs (this could do more muscle damage). Another move to reduce tension in the neck and back, Cat-Cow gently flexes and extends the back torso and neck, allowing for optimal mobilization and flexibility of the shoulder girdle and spine, as well as subtly strengthening the abdominal organs. Cat-Cow also opens the chest which helps eliminate the initial strain on the shoulder muscles that cause slumping. 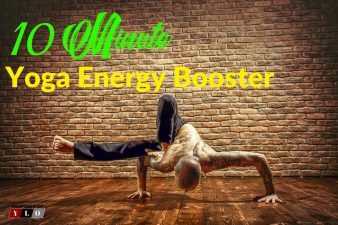 • Start by sitting on your hands and knees (like a cat). • Slowly arch your back upwards and control your breathing (this is the “cat”). • Then slowly lower your back until it is almost sagging, feeling the release of stress and fatigue in your shoulders and spine (this is the “cow”). • Make sure to softly raise and lower your neck as well- allowing the muscles to stretch and loosen. This pose uses the strength of your arms and legs to fully support and stretch your spine. It strengthens the hips, hamstrings, and calves while simultaneously strengthening the quads and ankles. It opens the chest and shoulders which will help loosen the local bands of hardened muscle. This will help to eliminate stiff necks. • Start out in Child’s Pose, arms outstretched in front of you, sitting on your knees. • Curl your toes under, pushing and lifting your hips up and back. • Place hands shoulder-width apart and firmly straighten your arms. • Keep feet hip-width apart and straighten legs (pressing heels down). • Feel the pressure and flexibility of the shoulders and spine and take deep, controlled breaths. A simple, yet effective move to stretch the spine in order to increase flexibility. This gentle forward bend targets lower back and neck relief by using gravity to pull the head down, flexing and extending the muscles of the torso. • Begin in Mountain Pose with hands on hips. • Bend forward at the hips, while exhaling. This will lengthen the front of your torso. • Let the crown of your head hang down as you breathe in and out. • Try to touch the ground with your fingers, and then your palms. • Do not lock your knees, and let your thighs slightly bend. • Feel the flexion of the spine and shoulders. Each of these poses is designed to focus on the shoulders and to eliminate stiff necks; however, true healing takes time. Patience will also be stretched and it’s important to remember that your body will not heal as fast as you probably want it to. Do these poses every day and listen to your body. If something hurts, don’t push too hard. Allow your body to grow and heal gradually, while consciously improving your daily posture and movements. All in all, the process may be long, but it will most definitely be worth it. By solving the root of these painful problems, the results will be long-term and will, therefore, benefit you the most in the end. Let us know if you have tried any yoga poses that eliminate stiff necks and how it is working for you. Our readers are always looking for information on how to feel better. The best way to avoid injury is by having strong, flexible muscles and joints. This will help you resist strain and injury. The back and neck were designed to move. Keeping them in a static or locked position for long periods of time, such as sitting at a computer screen for hours, increases the risk of you straining your back or neck. Take frequent breaks away from the computer screen to stretch using these exercises. 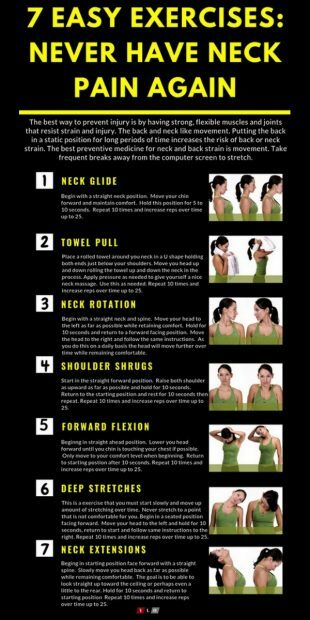 Here are 7 easy stretching exercises that can relieve simple cases of neck ache. They can even be used on the job to relieve neck pain. Begin with a straight neck position. 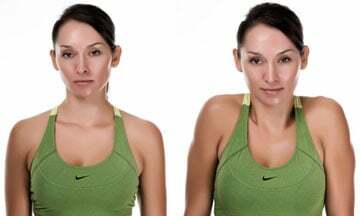 Move your chin forward and hold this position for 5 to 10 seconds. Pull chin back past starting position as far as you can comfortably go. Hold 5 to 10 seconds. Return to straight neck position. Repeat 10 times. Over time increase reps up to 25. Place a rolled towel around your neck in a U shape holding ends with both hands. While applying slight pressure on your neck with the towel to give your neck support, slowly look up as far as you can. Do NOT hold the position, but return to starting position in one smooth motion. Repeat 10 times. Over time increase reps up to 25. Begin looking forward with a straight neck and spine. Turn your head to the left as far as comfortably possible. Hold for 10 seconds and return to a forward facing position. Move the head to the right and follow the same instructions. Your head will be able to comfortably move further over time. Repeat 10 times. Over time increase reps up to 25. Start in a straightforward position. Raise both shoulders as high as possible and hold for 5 to10 seconds. Return to the starting position, rest for 5 seconds. Start again. Repeat 10 times. Over time increase reps up to 25. Begin in straight ahead position with head tilted left. Lower your head forward until your chin is touching your chest if possible. Do not go past your comfort level when beginning. Return to starting position after 10 seconds. Tilt your head to the right and follow the same instructions. Repeat 10 times. Over time increase reps up to 25. This is an exercise that you must start slowly and move up the amount of stretching over time. Never stretch to a point that is not comfortable for you. Begin in a seated position facing forward. Move your head to the left and hold for 30 seconds, return to start and follow same instructions to the right. Repeat 3 times. Over time increase reps up to 10. Begin in starting position face forward with a straight spine. Slowly tilt your head back as far as possible without arching your back. The goal is to be able to look straight up toward the ceiling. Hold for 10 seconds. 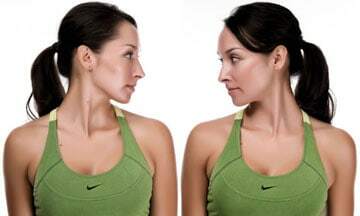 Slowly raise neck back to starting position and tilt your head forward till chin rests on the chest. Hold for 10 seconds. 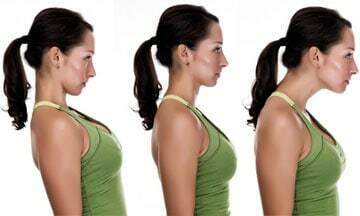 Slowly raise head and return to starting position Repeat 10 times. Over time increase reps up to 25.